There are few things that evoke the sense of Mediterranean gardens more than sun-warmed stone patios with bright flowers, olive trees, drought tolerant shrubs like lavender and sage and thyme planted in cracks of a rock wall. The light in the Mediterranean has a certain quality, and when the first settlers went to California from the east, that was one thing that struck any who had been in the Mediterranean – the feature of that light, intense and hot, and the long summers spawned a type of garden that we could call West Coast Mediterranean. Other areas that have this same combination of light and warmth are the southern interior of British Columbia and some of the Gulf Islands. The plants that thrive in these conditions are typical of those found in the Mediterranean, in Spain and Greece, Cypress and Turkey. Many of our favorite flowers and bulbs originate there, in the arid summer climate. Common bulbs such as the familiar garden tulips have been bred from the species native to the Mediterranean. The seeming frail Cyclamen is as hardy as they come in the right conditions, actually requiring a summer drought to ripen its corms. Rosa species, many highly scented, grape vines and fruit trees have come to us from the Mediterranean during the Crusades which took place across the whole of Europe and the Middle East. 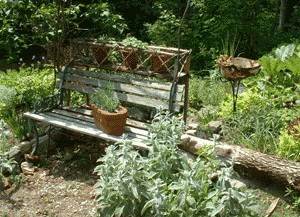 Spices were valued and plants and seeds brought to England and France to be planted in potager gardens. Some of these plants adapted, and thrived, others craved the warmth and sunlight so sadly lacking. Courtyards surrounded by stone walls to capture the suns warmth provided the perfect conditions for these heat loving plants. Courtyard landscaping can be a microcosm of a Mediterranean garden in miniature. 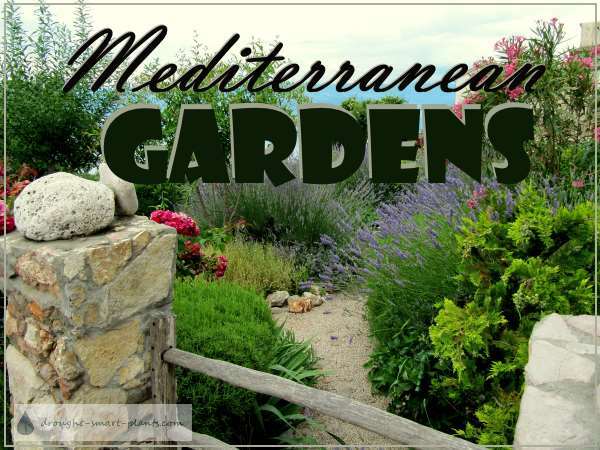 If you’re lucky enough to garden in a dryer climate, with bright long days of sun, mild winters and ample rainfall in the spring, then you can easily grow a garden reminiscent of the Mediterranean. Concentrate your choices of plants from those with grey, silver or fuzzy foliage as these have the required drought tolerance, as does any plant with ample essential oils such as Lavender, thyme, oregano, Monarda or the leathery leaves of Iris, or the succulent leaves of Sedum and Sempervivum. Mediterranean gardens were always grown using xeric principles and xeriscape design, before there was even such a word as xeriscaping. Drought tolerance, low maintenance, food production and beauty wrapped in one gorgeous light filled space make Mediterranean gardens unforgettable.